For all the pumpkin lovers out there, IHOP has the perfect menu item just for you. Pumpkin Pancakes, IHOP restaurants’ most popular seasonal item, will once again, be available at participating restaurants throughout the country. Guests of all ages can enjoy this Halloween treat, made with real pumpkin, long past the end of the spooky holiday from now until they vanish – like ghosts – on January 3. 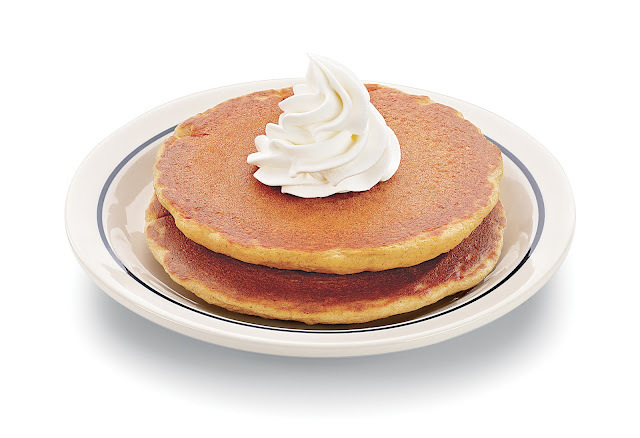 Each order of IHOP restaurants’ signature pumpkin pancakes, made with real pumpkin and spices, comes crowned with creamy whipped topping. Guests can order pumpkin pancakes alone, or as a combo served with two eggs, any way they like ‘em, hash browns, and a choice of crispy bacon, pork sausage links, or sliced ham. And, for the first time ever, guests at participating IHOP restaurants can order a cup of piping hot pumpkin coffee that combines IHOP restaurants’ 100% Arabica International House Roast Original™ coffee with a touch of pumpkin syrup, made with real pumpkin, and then crowns the cup with whipped topping and a sprinkle of pumpkin spice sugar. Both pumpkin pancakes and pumpkin coffee are available at participating restaurants until January 3. Don't forget, IHOP gift cards make the perfect gift for any occasion! I'm loving all things pumpkin this season. Pumpkin pancakes? Yes please!